For many years, concrete has been used as the preferred pavement material due to its robustness and ability to withstand all types of environmental hazards. Even with such strength, concrete can still be compromised if extreme forces are applied to it. It can crack, form holes, and furrows which will interfere with the efficiency of the pavement. With proper maintenance tips, you can always keep your pavement in an excellent condition. At times, concrete pavements can encounter problems which are hard to spot. Some weak places could emerge beneath your pavement, and if they are not identified in time, they could result in bigger problems. A scheduled maintenance will help to identify these weak places and you will have the ability to rectify them in time. The end results are that you will keep your pavement in excellent quality at all times. Not all people can examine a pavement and know and find its weak areas, which explain why you can engage with concrete driveway contractors in Gloucester County to do the work for you. Engineers in Gloucester County not only have the right skills but they are experienced to handle all your pavement issues. During summer, your pavement will be heated by the intense sun. It will expand and if there is any sort of dirt or debris, it may lead to cracks over time. Take time during winter and clean your pavement to eliminate all kinds of accumulated debris. Your driveway should be well-maintained and kept clean at all times. This way, it is always safe to use. If you want to ensure that your driveway is cleaned thoroughly, hire a professional cleaner to do the work for you. Any fissures or holes will increase in volume during summer. You need to make sure that you seal these holes early enough so that when summer comes, your driveway will remain intact. 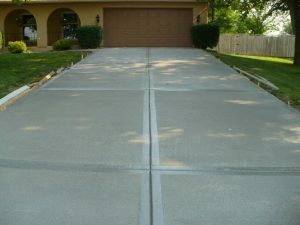 Driveways that are left with any kind of openings and fissures will become worse because when you step or drive on them. You need to hire an expert to do the sealing so that you do not make any mistakes. Remember, not everyone has the technical skills for such tasks! If live in a place with a harsh winter, metal ice chippers and metal-edged shovels are some of the tools you might be familiar with. It is recommended that you keep them away from your driveway as they can damage its surface. Consider replacing those chippers with plastic ice shovels as they won’t be able to nick the surface of your driveway. What’s more, they allow you to clear snow with exceptional ease. If you own a snow blower, be sure to raise its blades high while cleaning. You don’t want to end up scraping the surface of your driveway. Proper maintenance of your pavement not only keeps it in mint condition but also makes it last longer and serve you well. Proper maintenance prevents unnecessary damages and this means you will not incur a lot of overheads.